Nestled in a quiet corner of Kelvin Grove is a stately Queensland, complete with sculpted lawn and wide verandas. In the high-ceilinged living room, two sisters who stumbled on the house late one night have made their disorderly home and have now invited an audience to come and hear their tales of love, loss and youthful confusion. The Travelling Sisters Let Loose is an eclectic 2-person show of original songs, personal stories, fantastical tales and laugh-out-loud moments. The two actors and creators of the show, Lucy Fox and Ell Sachs, threw heart, soul and a whole lot of energy into entertaining their audience. They leapt from couch to table, flirted, chatted and sang for our entertainment as we collectively inhabited their personal space. The most enjoyable moments for me came courtesy of Lucy and her alliterative original compositions. Her Tim Minchin like lyrics told a tale cowboys, shamans, seas voyages and pirates accompanied by delightful animation and Ell’s sound effects and well-captured characters. At one point I thought the whole audience would be called upon to help Ell construct a blanket fort, but it was only my wishful thinking. If you like theatre with extras, this is a wonderful show for you. Tea and coffee on arrival and delicious brownies for sale, bags of popcorn when the film began and home-made biscuits at the half-way point. There was even a friendly house cat for you to stroke, to heighten the feeling of snuggling down in a dilapidated but welcoming home. The Travelling Sisters Let Loose is an intimate performance, with only some 20 people allowed in to the living room to get comfy on couches, armchairs and cushions. The show is sold out for Friday 10 May but there are four more shows. Travelling Sisters is a welcoming, personal, enjoyable show with a little something for every audience member. Particularly enjoyable on a chilly night. 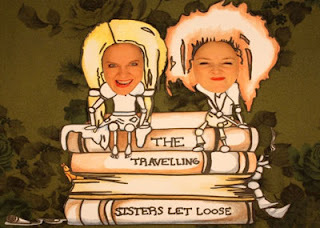 Review of The Travelling Sisters Let Loose, presented as part of the 2013 Anywhere Theatre Festival.